Click on the Big Book to listen to an audio version from A.A. World Services. 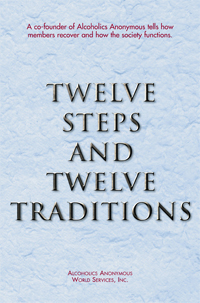 Click on the 12 & 12 Book to listen to an audio version from A.A. World Services. Peter M. and Chris S. - Step Workshop - Minneapolis, MN, 2008, and Twelve and Twelve, from District 41 AA, Johnstown, Pa.
Talks by Father Marten, Talks by Father John Doe, Discussions by Sandy B., Saturday Morning Live and more from Silkworth.net. AA # 3 Bill D.
Please note that many images and text are property of and are used with permission of A.A.. World Services.